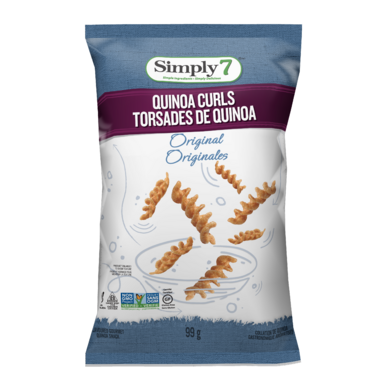 Simply7 Original Quinoa Curls have just a pinch of salt on this light and crunchy quinoa snack. Simply 7 Quinoa Curls bring a twist to this popular ancient grain with 5g of plant-based protein per serving. Since 2011, it’s been their mission to show people that simple ingredients are actually delicious. They take their 7 Simple Standards and favorite veggies and grains from around the world and make them into tasty, flavourful, good-for-you snacks. Find your perfect crunch. Snack Tip: Savor by itself, with your favorite dip or on top of a salad - the snacking options are endless!